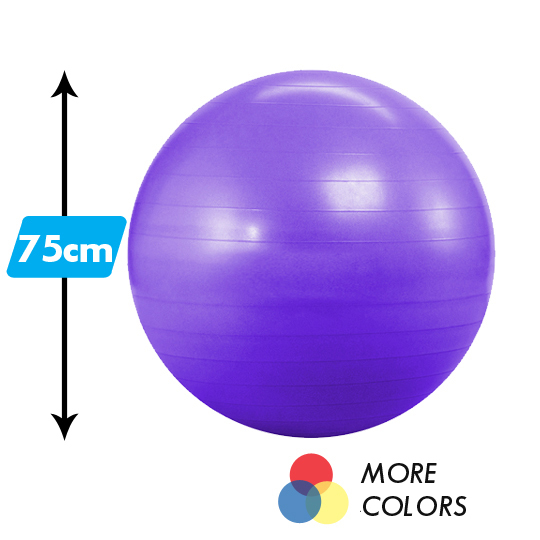 Recommended for tall fitness fanatics: 5'11" to 6'5"
The 75cm Anti-Burst Yoga Balance Ball from Yoga Accessories is a fun tool for yoga, Pilates, stretching, and even in the office as an alternative desk chair! Also known as swiss balls, fitness balls, yoga balls, core balls, or exercise balls, our high-quality balance balls are made from thick, durable vinyl and can support up to 600 lbs of pressure! Ball ships deflated and comes, for $1 more, with a hand pump for easy inflation! In addition to the Standard Hand Pump, we also have a (super speedy) Deluxe Hand Pumps and Foot Pump. Click HERE to learn more about how to properly inflate, maintain, and select the right size of your balance ball. We love the yoga balls and will continue to buy them from Yoga Accessories as needed. Use instead of office chair. I got my wife this ball because the one she had before burst at her work. She was disdisappointed, I found this site and she loves the stability and told me they seem better than the ones she used before. Thank you for having a decent product at a great price. I needed to get yoga balls for my physical therapy office to aid in my patients recoveries. I took advantage of the wholesale rate and my wallet and my patients are all very happy. These balls are strong, slip resistance, and easy to pump up.